The Three Rivers Rod & Gun Club is located in Three Forks, Montana and lies along the west bank of the Madison River in the lower Madison Valley, which is the least developed river valley within 30± miles of Bozeman. 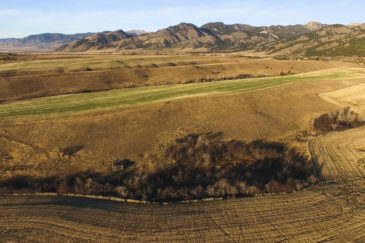 The ranch varies from thick cottonwood galleries along the river corridor to sub-irrigated meadows with meandering creeks. The river braids offer abundant wetland habitat which attracts a wealth of waterfowl and other wildlife. The views are equally diverse and dramatic with the Bridgers to the east and the Spanish Peaks and the Tobacco Root Mountains to the south and southwest. Because of all the fabulous water amenities and lack of development, wildlife thrives in the lower Madison Valley. For the waterfowl hunter, there is an abundance of opportunity. The Madison River and all its side channels support local varieties of nesting waterfowl. As northern migratory birds arrive and the Madison River freezes in late fall, ducks and geese search for open water which concentrates their numbers on the slough located on the ranch along with other bits of open spring water in the valley. The 557± acre Lodge Parcel is available for $1,500,000.